Posted from Seattle, WA on April 23, 2018. 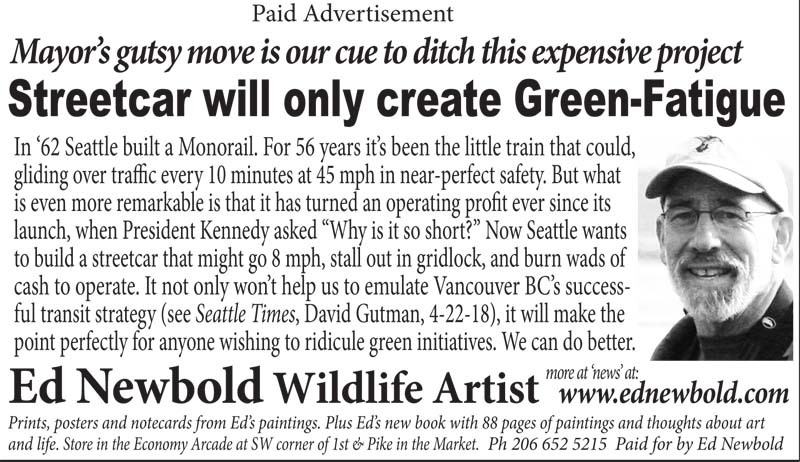 An ad I’m running in the Seattle Times A-section on Sunday, April 29, opposes the First Avenue Streetcar. Here is the ad, which is pretty self-explanatory. I compare the Streetcar to the 56 year old Monorail and find the Monorail to be vastly superior. It is the only transit in the country that turns a profit, and yet the transportation planners try to deflect that fact and minimize this achievement. It should certainly get our attention, however, as it suggests we should really be thinking of transit as a cash cow of the future, not a sinkhole to pour money into.